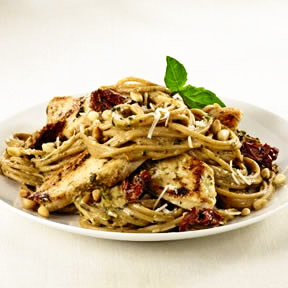 This Chicken Pesto Pasta Recipe is a favorite restaurant recipe for both chicken and pasta lovers. 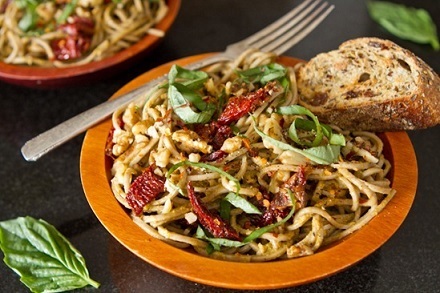 The addition of sun-dried tomatoes is one of the ingredients that make this a favorite restaurant recipe. 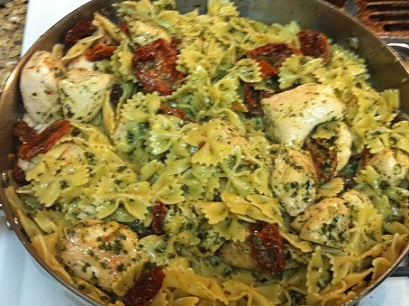 This chicken pasta recipe uses fettuccine but you can easily substitute another pasta if you like. I do so frequently depending on the "look" I want and the product on hand. Don't miss reading the article about pasta. I also like fresh basil leaves with this dish, but that, too, is optional. Freshly grated or super thin-sliced Parmesan cheese adds a great deal to this meal. Also, to round out your meal, add a salad and some delicious garlic bread. Preparation time: 20 minutes. Serves 2. Did you know? Pesto is a sauce originating in Genoa in northern Italy, and traditionally consists of crushed garlic, basil, and European pine nuts blended with olive oil, Parmigiano-Reggiano, and Fiore Sardo.